Parsley has been cultivated for 2,300 years and used in the kitchen. 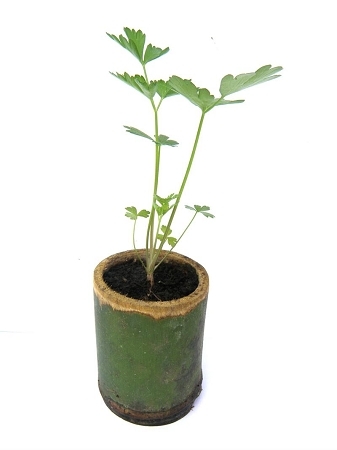 This Italian flat leaf plant has been grown organically and comes in a reusable bamboo pot. Parsley likes sun and moist well-drained soil. Flat-leaved parsley is preferred by some as it easier to cultivate, being more tolerant of both rain and sunshine, Great as a companion plant to tomatoes and sweet peppers. Italian flat leaf parsley has a stronger flavor than the curly parsley so use in small amounts until you decide how much is good for you. Highly revered by Italian cooks in Italian dishes such as spaghetti. All of the parsley varieties are high in Vitamins A and C and the minerals, iron and calcium.